In 2013 Intale started planning the creation of its core product. What we wanted to create was a extremely easy-to-use Point of Sale application for the non-tech literate user, targeting store owners or employees of small convenient stores selling packaged goods. Most of the requirements and the user knowledge was already in the hands of the company, due to the fact that there was a traditional POS application already established on the market by Intale. After specifying the minimum viable product, I started visualising the interface and came up with the first wireframes and paper prototypes. As mentioned before, I I have been working for this project since day one. I started out being responsible for the User Experience, Interaction and Interface design as well as every visual aspect of the product. At the same time I created the front-end architecture of the markup (HTML and CSS) having an extremely productive collaboration with the front-end and back-end engineers. Currently I am positioned as the Head of Product, managing all aspects of the product. I am responsible of keeping all the stakeholder informed, which leads to better decision making at a company level. I manage the backlog, making a case for the reason behind each feature,an improvement or a change that we need to implement. I am also the UX Lead overviewing analysis, design, user feedback gathering and utilisation, while managing the design team. Finally, I’m coding on the front-end maintaining a custom CSS Architecture and the markup of the Product. Intale Point is separated in two distinct parts, Intale POS and Intale Back Office. Intale POS handles all point of sale functions while Intale Back Office is a complex full blown Cloud application covering, inventory, procurement, customers, accounting and reporting functionality. The POS is a hybrid iOS app that has been built by using web technologies which allows us to easily support other devices such as Microsoft Windows devices. The objective from the beginning was speed and usability, so the app is optimized for maximum UI performance. The Back Office application is a webapp build based on Microsoft technologies. 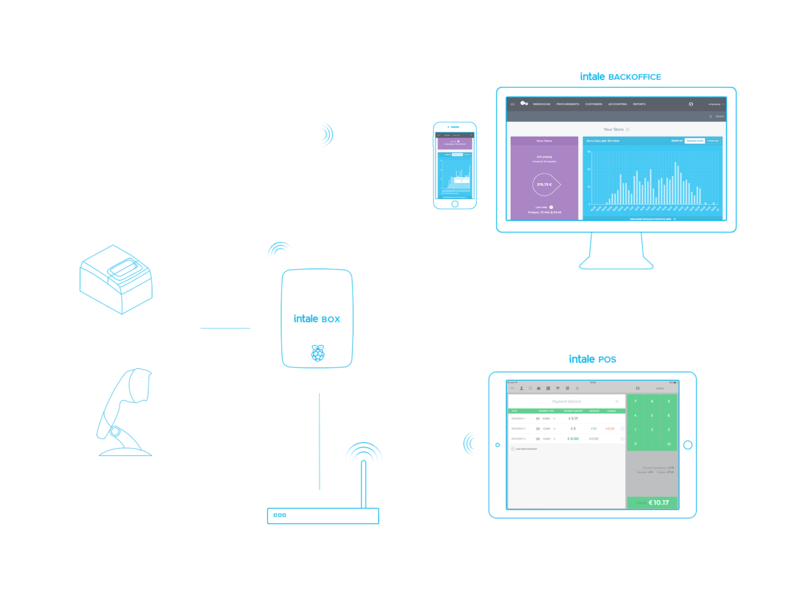 All transactional data created at the POS are automatically synchronized to the Cloud and are accessible through the Back Office App. 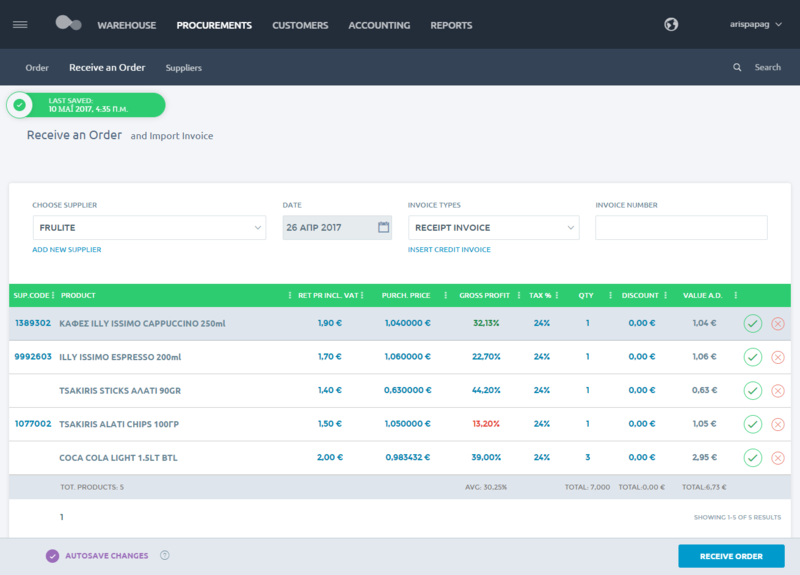 One of the most difficult parts of the product was and still is, its business logic, having to deal with the real world complicated matters of invoicing, and data production and visualisation, customer and personnel management, and relationships between suppliers and retailers. We accomplished to simplify the information delivery to a level that benefits our customers giving them the knowledge to take decisions and steer their businesses. To give real benefit to a very traditional and difficult audience, the interface and interaction play a very significant role in the success of Intale Point. We created all interfaces, as simple as they could be. Simplifying such a complicated field is not an easy task, and we managed to create a very smooth learning curve for our users. All actions on the items (products) on the basket, are controlled by color coded gestures, maintain the color coding across the platform. There is a video here showing UI interaction. To see it please update your browser. An always visible interactive numpad is rendering the color of the action which caused it, while giving immediate feedback to for the state of the action. The core functionality of Intale POS. Items can be added to the basket by scanning their barcodes or by pressing on user created shortcuts. The user is able to add the received amount and get feedback of the correctness and the change that has to give back. Easily adding and removing discounts to items. Depending on the type of discount, cent or percentage, the interactive numpad is activated accordingly. By dragging the footer of the basket, the user is able to add a percentage discount to the entire basket, keeping the color coding of discount as well as remove the entire basket. On the charge area the user is able to enter the payment options menu, by dragging the charge button. Special focus was given here, for the pixels of allowance for avoid accidental button movement, when pressing the charge button. On the payment options menu the user is able to select the payment type as well as add more that one payments to split the total amount between, card payment, cash payment, and customer credit payment. Here, the user is able to manage the customer credit and allow a known customer to use the credit for the payment. The interface drives the user to complete the transaction step by step, always informing of the next needed action. At the same type the user can decide on the payment according to the current customer credit which is displayed on the customer list. Item shortcuts are a significant function on Intale POS, allowing the user to easily sell items with no scanning ability (no barcodes) and fast moving goods. The user is able to create shortcut categories and add items to them while differentiate them with selected colors. Intale Back Office is a responsive cloud based Application. It’s designed to run on browsers from mobile resolutions to Desktop PC’s. All elements are responsive from inline menus to large complex multi functional grids, and modals. 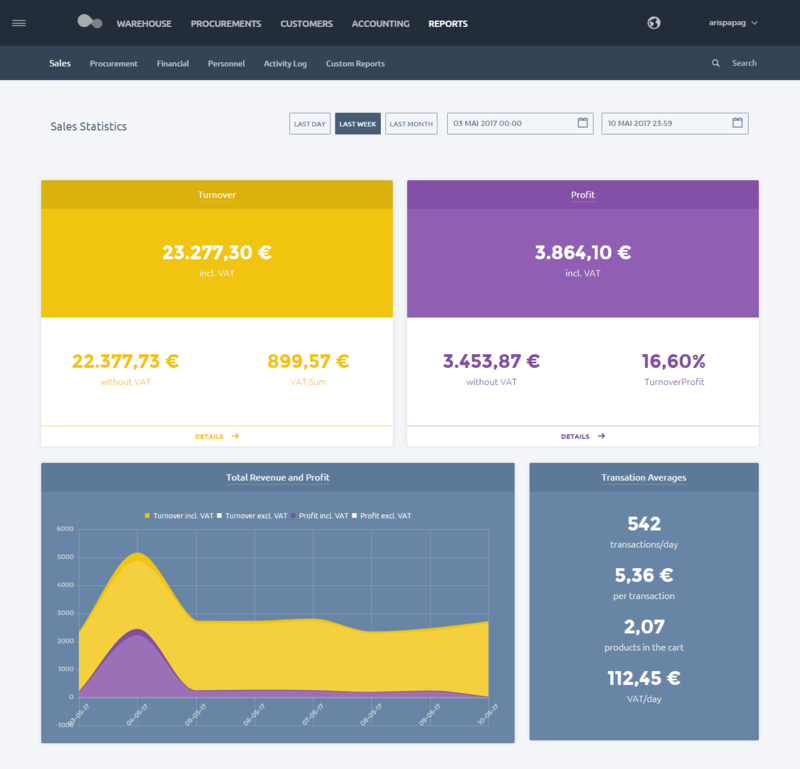 In the starting page of the Back Office application the user is able to have a quick overview of it’s personnel and current till, sales of the past 24hours, pending orders and warehouse status. On the Back Office application the user is able to get reporting on sales, purchases, personnel, financial status as well as tracking the activities that took place in the store, in real time. 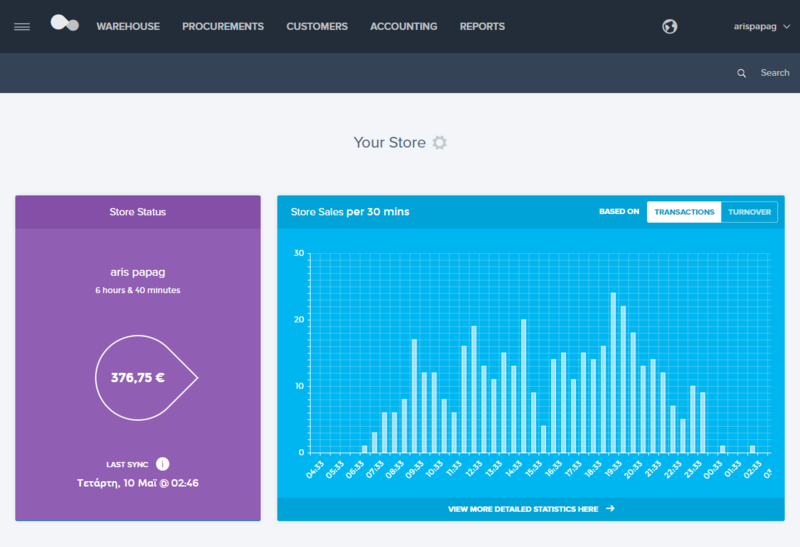 Sales insights inform the store owner of the progress of sales while giving the ability to compare between same day and time slots. One of the most important functions of the store. This featured packed action enables the user to inform the system of an order that arrived. Doing so, will update stock levels, average purchase prices and supplier balances keeping the system up to date providing correct information and reports. Intale Point was a huge challenge and a great success. In a short period the product managed to go out in the wild and conquer the difficult and challenging Greek market and now is ready to expand globally. Currently it is being updated weekly and is getting better every day. Its value is visible and obvious to Intale’s clientele, which is more than happy to promote its unique selling proposition.